Design your perfect swing set in minutes. The fully customizable process leaves each step of the designing phase up to you and your children. Have fun and don’t forget to save your design! Choose a base tower that is the perfect fit for your backyard and budget. Select your favorite roof style. Canopy made with heavy-duty vinyl. Wooden roof crafted with premium redwood. Select your preferred swing beam size. The more swing positions you choose, the more play activities you can have. Select your children’s favorite play activities. Make your design truly unique by adding extra activities that will make your backyard adventure nearly complete. For the ultimate adrenaline rush, be sure to add a slide. We have a wave slide and a spiral slide available on most tower designs. Please select up to three slides and where you would like them placed. The action packed adventure continues under the play deck. For a diverse set of play activities, add a sandbox, swiveling tire swing or picnic table (if applicable to your design). Your custom design is almost complete. To add more imagination or function to your design, choose from our quality selection of accessories. These accessories will not be rendered on your configuration image, but they will be included with your order. Fill out this form to have your configuration saved for purchase at a later date. A link to this configuration will be emailed to the address provided below. Send me Monthly Announcements of Store Specials and Introductory Offers! Would you like to save your customized design first? If you don't save your custom design, you will not be able to retrieve it later. Fill out this form to save your configuration and order by phone. After filling this form out, one of our customer service representatives will call you to complete your purchase. Questions about Dimensions? 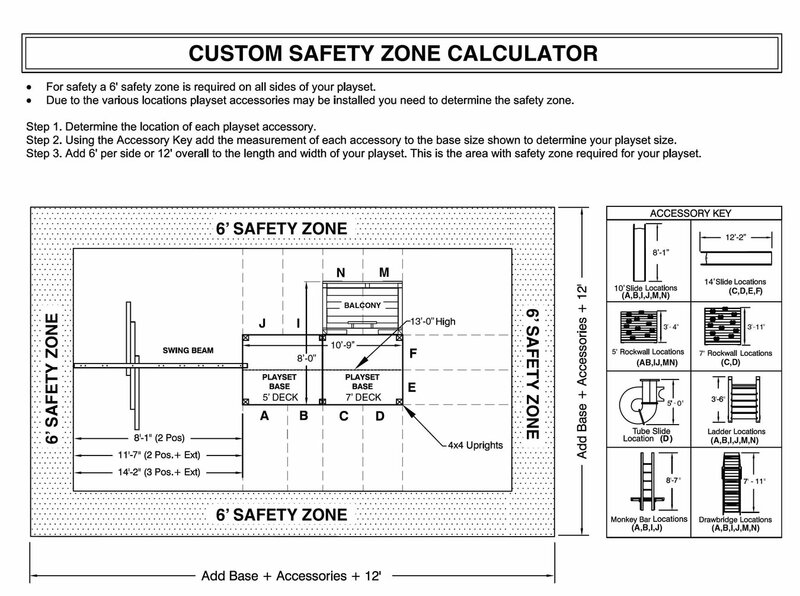 Check out our Custom Safety Zone Calculator. Our state of the art designer gives you the power to create custom playground sets to match your child's favorite play activities. Adding a balcony doubles the fun too! The easy to use designer will let you know what option fills in each slot. Be sure to use the location key above as a guide to determine what each letter stands for. Invite the whole family to watch as your custom playground set comes to life. After you're content with the design, you can simply add it to your cart or order by phone. If you get distracted and want to resume your design later, you can save it too. Your design will be saved in our database and you will receive an email with a link to your design. It's that easy! Play deck: 62.5 sq. ft. The following specs are for add-ons not included in the base tower, but may be featured in your customized design. We design our swing sets to bring the excitement of the common playground to backyards across America. However, we have become the most respected swing set manufacturer in the U.S. by putting safety first, always. As an active ASTM safety committee member, we have gone beyond the normal safety guidelines to ensure your children are always safe. Here are the safety features included on our swing sets. Add a fall surface (ground cover) under your swing set. While our redwood sets are hand-crafted to eliminate unnecessary cuts and scrapes, we suggest adding a fall surface under your play structure to add another layer of protection for your children – just in case they lose their balance and fall. We recommend adding rubber mats, rubber mulch, wood chips sand or pea gravel under your swing set. To see a pros and cons list of the best materials for under a swing set, check out the resources tab on this page. For a detailed guide on swing set fall surfaces be sure to check out our resources tab on this page. Don't worry, any empty positions/slots will be automatically filled with safety rails for your child's safety. Design your own models derive from the Premier Redwood Series. All design your own configurations include four safety handles. This swing set is not intended for public use. It is intended for residential use and is not warrantied for public or commercial use. How many kids can fit comfortably on the swing set? This swing set has been designed for use by a maximum of eight children at one time, having a combined weight of 1,200 pounds. This swing set is recommended for children 3 years through 11 years of age. Once your swing set is built and ready to ship from our shop in Monroe, MI, the delivery company will contact you to schedule a delivery date and time. The typical swing set will be delivered curbside and comes in multiple bundles/boxes. Some larger packages may need to be opened and hand offloaded to the ground. It might be helpful to have another person help you bring the components into your backyard, but it not a necessity. We welcome anyone to build our swing sets, even those with little do-it-yourself experience. Each children's swing set kit is pre-cut, ready for assembly and can be built with basic tools, so you don’t have to be Bob Vila to install our swing sets. Actually, parents often comment on how much pride they have building their swing set on their own. Don’t worry, if you have questions during assembly, our dedicated customer service team can answer your questions via phone or online chat. We also offer professional installation on this swing set for as little as $499. Periodic maintenance is suggested to ensure safe enjoyment of your swing set and optional accessories. Be sure to check out swing set maintenance checklist within the resources tab on this page. 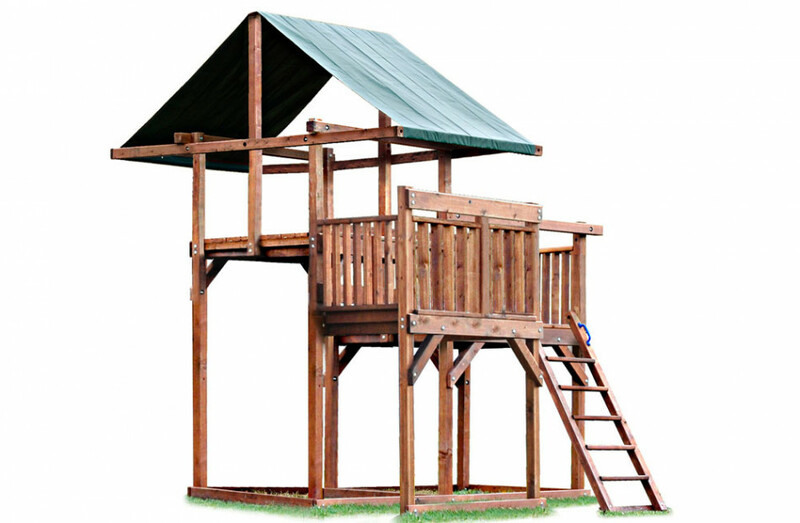 Our redwood swing sets are factory stained to provide a beautiful finish and long lasting protection. We recommend staining swing sets once a year to maintain its rich color and naturally resilient qualities. Prior to staining, clean all wooden components. Use a high quality water based stain or sealant such as Thompson’s Water Seal® . After staining or sealing, please allow 24 hours to dry before allowing children to start their adventure. ou promised it would take 4-7 hours to put together and you were right! It took us only 4 hours from the time we stepped outside until my daughter could use it. The directions were so easy, especially since we'd never tackled a project like this before. And the set is still holding strong after one of the harshest New England winters we've had in a long time. Thank you very much for providing such a superior product and customer service to match. We will be recommending you to all our friends and neighbors. Here is the final set-up for our grandchildren's set. Just finished putting in the rubber mulch today. I would be happy to give your company the highest recommendation for the quality of craftsmanship, the clarity of instructions, and the excellent support that your employees gave me the few times that we were in contact. Great Job Caleb! I love how kind you were to Elijah, when he came up and wanted to dance with you. Looks like you had fun! Jessica did a good job with the fimling as well.Maybe the Hutchison siblings can make some more videos together? I'd like to see it.